Looking for some unusual pumpkin recipes? Pumpkin Supper Surprise is a delicious baked stuffed pumpkin recipe. It's fun to cook and serve your dinner in a pumpkin shell! The first time I made this, we had two surprises: we were surprised at how delicious it was, and we were surprised that the pickiest eater in our family asked for seconds! I use a small pumpkin, about 6 inches/15 cm in diameter. If your pumpkin is larger, you can double the amount of filling. I wouldn't use a pumpkin much larger than a soccer ball. You need a pumpkin that will fit into your largest pot. Be sure to cook the rice ahead of time - or use leftover rice. Cut off the top of the pumpkin as though you were planning to make a jack-o-lantern. Scrape most of the stringiness from the sides. Place the pumpkin in a large pot and cover it with water. If the pumpkin lid fits in the pot, put it in too. If it won't fit, discard it. Reduce heat and simmer until the pumpkin is quite tender but is still able to hold its shape well (about 30 minutes). Heat the first amount of oil in a large skillet. Add the ground beef and onion, and cook until the onion is tender and the beef is no longer pink. Add the cooked rice, second amount of oil, vinegar, pepper, garlic, raisins, apple and ketchup. Cook over low heat, stirring, for about 10 minutes. When the pumpkin is ready, drain it (carefully!) and place it in a large baking pan or roasting pan. 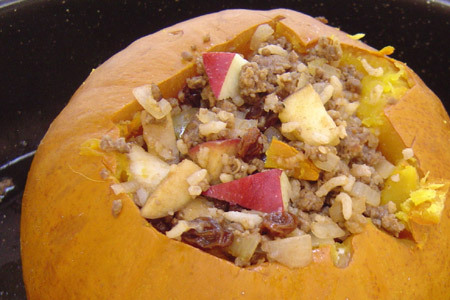 Fill the pumpkin with the beef mixture. Cover the opening with aluminum foil (or with the pumpkin lid, if you cooked it and if it will fit). To serve, cut the filled pumpkin into wedges and place each wedge (with filling) on a plate. Eat everything except the pumpkin skin. Use any variety of rice in place of the white basmati. Use another vinegar in place of the cider vinegar. Use plain tomato sauce, or diluted tomato paste, in place of the ketchup. Try using another ground meat instead of ground beef. How about ground turkey or chicken, or ground pork? For a vegetarian option, you could even use a soy "just like ground meat" product. Experiment with different dried fruit in place of the raisins. How about currants, or dried cranberries? Don't have eggs on hand? You can leave out the beaten egg. The filling won't hold together as well, but it will still be delicious. To drain the pumpkin, put on your oven mitts. Carry the large pot - very carefully! - to the sink and gently pour off the water. Still wearing the oven mitts, gently pick up the pumpkin and pour out any remaining water. (I've tried lifting the pumpkin out with large spoons, but it is so soft that it tears.) Your oven mitts will get damp, but that's okay. They will dry! Pumpkins are usually plentiful and inexpensive at the end of October. Buy several, and store them in a cool place to use in this and other pumpkin recipes. This has become our favorite of all our pumpkin recipes. Return from pumpkin recipes to easy Halloween recipes.